#1) Tottenville (4-0, Last Week: No. 1) The dominating offensive ways of the Pirates continued this past week as they blitzed past Susan Wagner at home on Friday night 42-0 as QB T.J. Brown '19 had two TDs via the air, and another on the ground to push Tottenville to 4-0 heading into what looks to be the PSAL Game of the Year. Next: Friday @ No. 3 South Shore. #2) Msgr. Farrell (4-0, Last Week: No. 2) Needing a last second-stand, the Lions held Cardinal Hayes on fourth down from inside the 15-yard line to come away with an impressive 26-24 victory over the Cardinals at home on Friday night. LB Chris Ortalano '19 scooped up a blocked punt and ran it in for the game-winning TD in the fourth quarter to help Msgr. Farrell grab a major CHSFL win. Next: Saturday vs. Iona Prep. #3) South Shore (4-0, Last Week: No. 3) After giving up their first points of the season during the fourth quarter of last week's win over Erasmus Hall, the Vikings defense got another zero up on the board as the defense led by LB Ivancile Jules '19 held New Utrecht scoreless for a 26-0 victory on the road on Friday with South Shore now heading into what looks to be the PSAL Game of the Year. Next: Friday vs. No. 1 Tottenville. #4) Midwood (4-0, Last Week: No. 5) It was another strong showing this week on both sides of the ball for the Hornets as led by QB Michael Bernard '19 who threw for two TDs it was Midwood easing past DeWitt Clinton on Friday afternoon 30-6 in what was a near-shutout performance on the defensive side as well if not for a last-minute touchdown. Next: Friday vs. No. 5 Erasmus Hall. #5) Erasmus Hall (3-1, Last Week: No. 6) Falling short last week to South Shore in their first-regular season loss in nearly two years, Erasmus came back with a vengeance on Saturday as they went to the Bronx and defeated JFK 34-0 as QB Jordan Arsmstead '20 had a smooth rhythm going to the tune of three TDs in helping the Dutchmen get back on track heading into another huge matchup. Next: Friday @ No. 4 Midwood. #6) Cardinal Hayes (0-2, Last Week: No. 4) Leading for nearly the entire game on the road against Msgr. Farrell, the Cardinals saw a blocked punt with under five minutes to go in the game be run back for the game-winning TD in what was a 26-24 loss to the Lions. QB Sofian Massoud '20 threw three TDs in the defeat. Hayes now goes home this week looking for win No. 1. Next: Friday vs. No. 9 Christ the King. #7) Lehman (4-0, Last Week: No. 7) As much as people didn't want to believe in the Lions this season coming up from the Bowl Division to the City Division of the PSAL, they keep showing that they belong as they demonstrated once again in a 51-0 blowout victory over Flushing on Saturday night. Eric Williams '19 had another huge day on the ground with three TD runs in what was a dominating all-around performance from the Bronx power. Next: Friday @ Harry Truman. #8) Abraham Lincoln (3-1, Last Week: No. 9) After a setback in Week 1, the Railsplitters have since been clicking in every way as on Friday night it was Israel Abinikanda '20 who ran for 140 yards and a pair of TDs in a solid 36-20 win over Canarsie. The Lincoln O-Line was a huge difference as well, creating all the running room as the Railsplitters again look to be a force in the PSAL. Next: Sunday @ Boys and Girls. #9) Christ the King (1-3, Last Week: NR) Moving back into the top 10 this week are the Royals, who have been competitive in each of their CHSFL games this season but were winless heading into Sunday's matchup with Chaminade. Christ the King though made a pair of big defensive stands late, headed by DL Jared Harrison-Hunte '19 to get win No, 1 at home over Chaminade, 14-7. Next: Friday @ No. 6 Cardinal Hayes. #10) Susan Wagner (3-1, Last Week: No. 8) Coming into the week unbeaten and with a ton of confidence, Wagner was downed by our No. 1 Tottenville team 42-0 as the offense never found a rhythm, even though the defense did look solid for most of the opening half before they wore down and faltered down the stretch in their first loss of the season. Next: Sunday vs. New Utrecht. #1) Moore Catholic (4-0, Last Week: No. 1) Rising to the challenge of playing one of the CHSFL's top defenses, Moore Catholic got two TDs passes from QB Vincent Scarola '19 as the Mavericks were able to coast to an impressive 38-14 victory on the road on Saturday night. The win keeps Moore unbeaten so far this season. Next: Saturday vs. Mount St. Michael. #2) Bayside (4-0, Last Week: No. 2) The Commodores kept on rolling as defensively they pitched a shutout in dominating Thomas Jefferson to the tune of a 41-0 home win on Saturday afternoon. On offense, QB Douglas Flug '19 again threw for a pair of TDs as the big signal caller ran the show to perfection for Bayside leading up to the big PSAL Bowl Division showdown this coming Friday. Next: Friday vs. No. 3 James Madison. #3) James Madison (4-0, Last Week: No. 3) It was all about the running game on Saturday for the Golden Knights as RB Mark Shepherd '20 continues to thrive for Madison as he ran for two TDs in what was an easy 30-0 win over Lafayette. 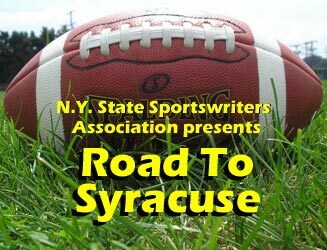 The game sets them up perfectly for what is the Bowl Division matchup of the year in the PSAL with the two best in the league on Friday set to square off. Next: Friday @ No. 2 Bayside. CHSFL this season. RB Zach Wallace '20 ran for two TDs, while QB Derek Bufano '19 threw for two TDs in a truly all-around convincing showing from Fordham Prep. Next: Saturday vs. St. Francis Prep. #5) St. Peter's (2-2, Last Week: #7) Going to Queens wasn't easy for the Eagles but after trailing 7-0 at the half against St. Francis Prep it was St. Peter's who controlled the play in the second half as QB Sonny Badyna '18 threw a late TD to put them over the top as the Eagles scored the come from behind 14-7 victory on Sunday. Next: Saturday vs. No. 6 Xavier. #6) Xavier (2-2, Last Week: No. 4) There wasn't a lot of offense to speak of for the Knights on Saturday night as they fell for the second straight week, this time to our NYC No. 1 Moore Catholic team 38-14. Xavier didn't get much going on the ground like they normally do though RB Daniel Vittiburga '19 was able to pound in a TD in the opening quarter, the only offensive score the Knights had in the game. Next: Saturday @ No. 5 St. Peter's. #7) Xaverian (2-2, Last Week: No. 8) The Clippers had things rolling early as they took a 30-6 halftime lead behind the three TD passes of QB James Reskar '20 before coasting home and easily taking down Mount St. Michael on Friday night 44-28. It was a great offensive output for Xaverian, which looks to be creeping up into the picture of teams who could be there in the end in the CHSFL. Next: Saturday @ St. Joseph by the Sea. #8) East Harlem Pride (4-0, Last Week: NR) It's finally time to give the Pride their due as they more than proved themselves on Saturday with a big second-half performance to get by Franklin K. Lane on the road 26-20. QB Taj Harvey '19 did it all for East Harlem as he threw for 148 yards, ran for 122 more and totaled three TDs in leading the Pride into the top 10. Next: Sunday @ Beach Channel. #9) Tilden (3-1, Last Week: NR) After some close and difficult contests to start the season, Tilden finally was able to get an easy one on the board as they made quick work of John Adams on Saturday 42-6 as RB Giovanni Philippe '21 ran for three TDs, including a pair in the opening half to set the tone in the win that brings the Blue Devils back into the top 10 for the first time in two weeks. Next: Sunday @ Thomas Jefferson. #10) Franklin K. Lane (3-1, Last Week: No. 9) Taking a lead into halftime at home on Saturday against East Harlem Pride, things got away from the Knights early in the fourth quarter as they fell behind and weren't able to rally back in a 26-20 loss. QB Shakel Clarke '19 was still able to rush for one TD and throw one TD, but it wasn't enough as Lane fell for the first time this season. Next: Friday @ Franklin D. Roosevelt. #1) KIPP NYC College Prep (3-0 Last Week: No. 1) Once again the KIPP offense was firing on all cylinders as QB Keenen Bingham '19 threw for three TDs to help push his team to a 46-6 blowout win over William Bryant. It wasn't just the offense though as the defense limited Bryant to under 150 yards of total offense in a great all-around effort to keep a stronghold of the top spot. Next: Friday @ No. 2 Petrides. #2) Petrides (3-0, Last Week: No. 2) Finding themselves trailing after three quarters for the first time this season, Petrides fought back behind the 105 yards rushing and two TDs of Tyheer Tucker '19 to help them rally past Stuyvesant on the road for a 30-22 victory heading into their big PSAL Cup Division clash this coming Friday night. Next: Friday vs. No. 1 KIPP NYC College Prep. #3) Poly Prep (2-2, Last Week: NR) Joining the rankings for the first time this season, the Blue Devils jumped out to a commanding lead early on and cruised to a 39-20 victory on Saturday against previously ranked Riverdale. Poly Prep is 2-0 when facing teams from New York State, though they are winless against out of state competition which the Blue Devils will look to change next week. Next: Saturday vs. The Pingry School (NJ). #4) Mott Haven (2-1, Last Week: NR) After losing a heartbreaker a week ago, the Mavericks re-enter the rankings off a 50-8 victory over August Martin. QB Brayan Anaman '20 threw for 112 yards and two TDs to help propel a huge first half offensive output as Mott Haven got themselves back on the winning track in convincing fashion. Next: Friday vs. George Washington. #5) Automotive (3-0, Last Week: NR) It was another fine performance from QB Christopher Cadet '19, who ran for two TDs while throwing for another in what was a 28-14 win for the Pistons over Alfred E. Smith. The win keeps Automotive undefeated on the season and puts them into the rankings for the first time, though their biggest test of the season now awaits. Next: Sunday vs. Benjamin Cardozo.